I have to admit that I rarely discriminate when it comes to sweets. Ice cream, chocolate, cookies... I love it all. With the recent cold, cold weather in NYC, I haven't let that stop me from enjoying ice cream-- I happened to visit Big Gay Ice Cream twice in one week night because the Salty Pimp there is just that good. The most interesting flavors. Luckily they are very kind and patient about letting people try as many flavors as they would like. I took full advantage of this. 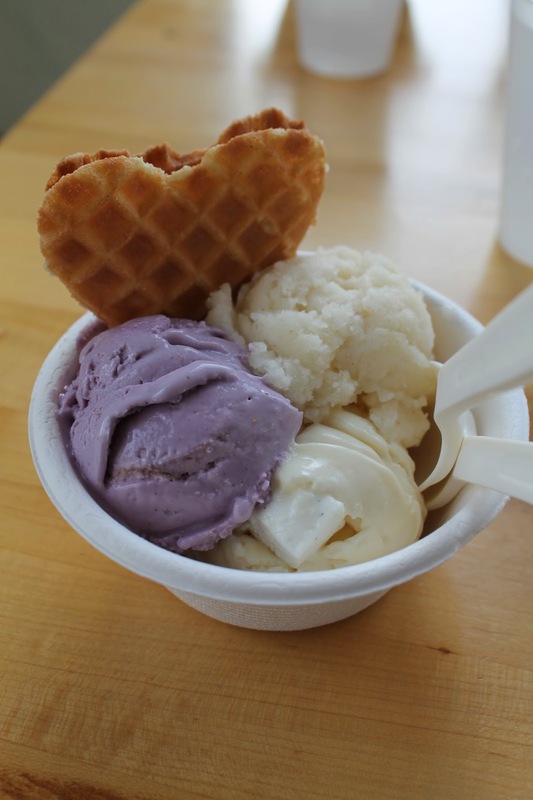 Trio with the waffle hearts, $5.50: (L-R) Wildberry Lavender, Riesling Poached Pear Sorbet, Birch + Marshmallows (limited edition). The lavender flavor was fruity and not too sweet. The riesling was strong and such an interesting addition to a sorbet. The birch + marshmallow is my absolute favorite-- a wintergreen flavor with hints of vanilla and root beer. It was described as having the taste of the foam on a root beer float, and that is precisely how it tasted. So amazing. Trio topped with delicious fresh whipped cream, $6: Oregon Fir (pine with grass-grazed cream), Birch + Marshmallow, Banana French Toast (Bananas and honey ice cream, with pecans, french toast, cinnamon, coffee, and maple syrup). Oregon Fir was the first flavor I sampled because it sounded so unique. Surprisingly, although it does taste a bit like grass, the sweetness and creaminess make it very pleasant. It was also a nice earthy flavor that complemented the sweet birch + marshmallows and banana french toast well. I just did a quick search on the website, and found that there are actually quite a few supermarkets and restaurants in NYC that sell pints and ice cream sandwiches from Jeni's! Very exciting news. If you're looking to see if they have Jeni's shops or products near you, go here. If you're looking for a nearby place to have lunch before visiting Jeni's, we did really want to try Silly Goose, a casual restaurant known for their sandwiches and couscous dishes. It didn't fit into our schedule, but if I do go back to Nashville one day, it's on my list! Summer was telling me how great this place was! even describing every flavor she could remember. she didn't mention black coffee though! haha When Sum is passionate about describing food, you know it must be pretty darn amazing.